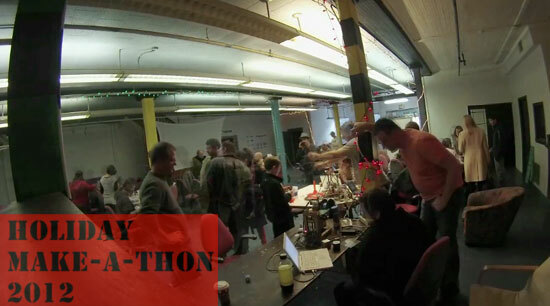 Here’s a quick time-lapse video from the 2012 Holiday Make-A-Thon that Milwaukee Makerspace does in cooperation with Bucketworks. We’ve been doing it for 3 years now, and Bucketworks has been doing it on their own even longer. It seems like a lot more hackerspaces are doing these type of events this year, which is awesome, and there’s even a nice name for it now: Hack Friday. In my mind, part of belonging to a makerspace/hackerspace is the love of creating things, sharing that with others, especially on a day that has become completely over the top in regards to consumerism. Our mission is plain and simple: Instead of buying useless crap on “Black Friday” join us and we’ll help you make something for the holidays. I figured it was also a good time to test out the time lapse capabilities of the GoPro Hero3. I have a workflow in place that includes taking still images with the intervalometer and then combining the frames into a video, and then resizing and cropping the video to the correct proportions. It seems to work. Oh, and the camera motion near the end is actually the gaff tape giving out before the camera fell face-down. Enjoy! Posted on Sunday, November 25th, 2012 at 1:19 pm. Subscribe to the comments feed. Both comments and pings are currently closed. Post on your own blog.